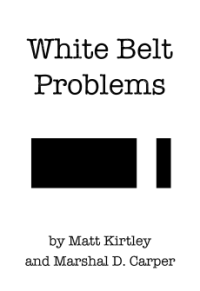 Home » White Belt Problems » I feel frustrated and discouraged about BJJ. Is this normal? I feel frustrated and discouraged about BJJ. Is this normal? Brazilian Jiu-Jitsu is hard. Actually, it is really, really hard. Right when you start to feel like you are making progress, an upper belt (or a lower belt in the most discouraging of scenarios) will visit your gym and drag your sorry body up and down the mats without breaking a sweat. Everything you thought you were good at suddenly feels stale and sluggish. Your timing is off, and you tap out over and over again. This experience could last a day, or it could last as long as a few months. Feeling discouraged like this, like you are not making any progress, is absolutely normal. Jiu-jitsu is a challenging sport because the subject material is intricate and complex and because the people training around you are motivated and driven as well. When they get better, the problems they present you are more difficult to solve. It’s a strange form of co-evolution. Embrace it. Otherwise, your discouraging moments will ruin jiu-jitsu for you.